Just a Little Ink: Love that Happy Mail! I'm sharing with you today a couple cards that I made recently for an in-the-mail-swap. I absolutely love getting cards in the mail! I'm going to guess that so do you. At least a couple times a year, there is a group of demonstrator friends and I who swap ideas from a recent catalog release. 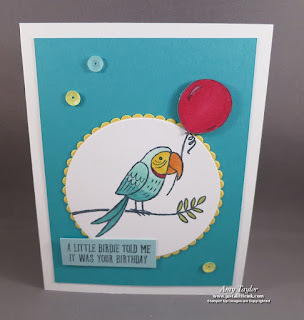 This time around it was making a card from the 2018 Occasions Catalog and one from the Sale-a-Bration Catalog. I didn't think that I liked the Bird Banter stamp set from the Occasions Catalog. But, as is usually the case when I go to a Stampin' Up! event, I saw it demonstrated and knew that I wanted it! Bird Banter is the stamp set used in the first card. I colored the bird using Stampin' Blends. Oh, how I love alcohol markers! 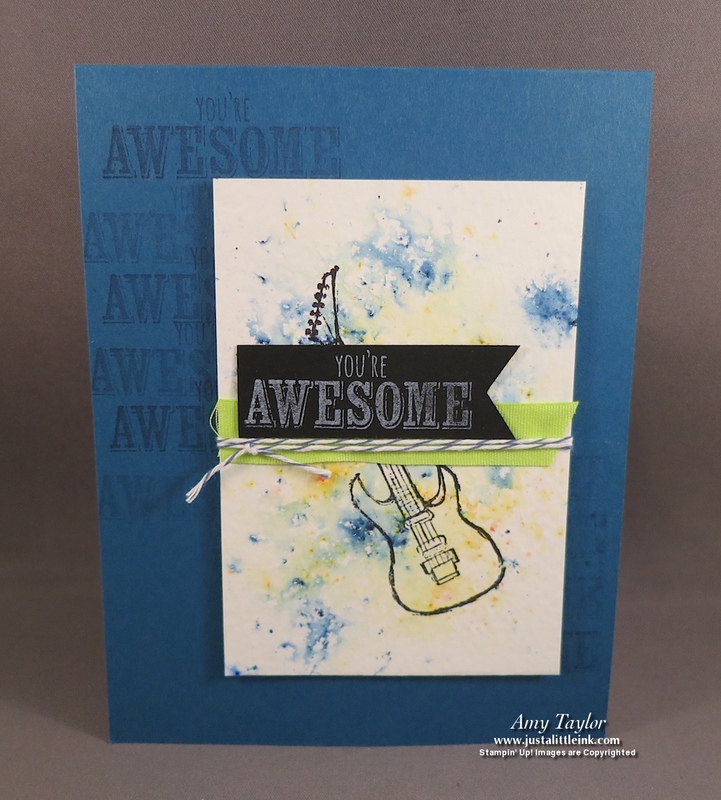 The second card uses Epic Celebrations, a Sale-a-bration exclusive stamp set. I used the Brusho Crystal Colour to give the "splash" of color behind the guitar. Just one of many uses for these watercolor powder crystals. I hope I've inspired you to go and create something beautiful.